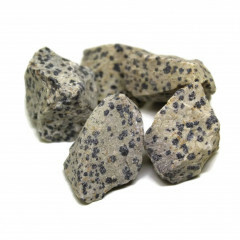 This unusual spotted stone is not tremendously valuable, but it is widely used as an inexpensive decorative stone, whether it is carved, dyed, or sold tumbled. 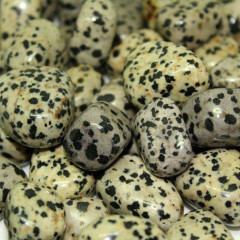 This spotted stone is reasonably common, and is found in Mexico. It is named after the Dalmatian dog, of course – the original miners supposedly named it to make the name easier for most people to remember. It is a fairly soft stone, and is easily polished, carved, or tumbled. It is also porous, and accepts dye easily – so it is commonly used as a decorative stone, in a range of colours including fairly bright shades of red, blue, yellow, and purple. Before dying, it is generally a dirty white to cream colour, with dark brown or black spots. Some people claim these spots are Tourmaline or Schorl, some claim they are Arfvedsonite. 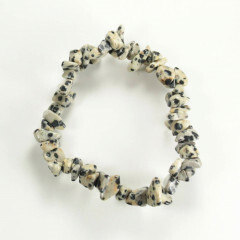 It is also sometimes referred to as Dalmatine or mis-spelt as Dalmation Jasper. Some people argue that it is not a Jasper at all, but we use the name as it is a commonly used trade name for this stone. 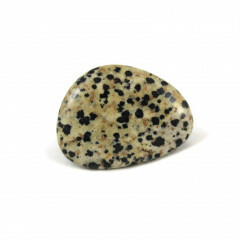 Some people believe this stone is especially helpful for positivity and mental attitude. They think it helps with balance and stabilising oneself. It is also thought to be a good stone for loyalty, possibly because of the dog that the stone is named after. It is aligned with the Sacral chakra.